Of all of this era’s grim political soundbites, is the worst “the squeezed middle”? This Miliband coinage takes a real problem (yes, middle-class incomes are rising less quickly than costs, privatised utilities are gouging their customers etc) and applies a subtle and divisive dogwhistle to it. The problem isn’t just that the bottom, the poorest, get neglected every time the focus is on the “squeezed middle”, although that is true. A living wage is a great policy, for example, but it does nothing for you if you don’t get a wage. Similarly, the Lib Dems redistributed upwards with their increase in personal allowances, all the while waving the policy in the air as a supposedly progressive figleaf over the ugly assaults on the poor they have perpetrated with the Tories. A higher personal allowance would be a fine thing, as would a restoration of the 10p tax rate.. if there was any effort to make the poorest, those out of work, significantly better off (which doesn’t mean threatening to take their benefits away unless they find non-existent suitable work), and also to tax the rich a bit more. No, the worse problem is hidden in the physics. If the middle is being squeezed, logically it’s being squeezed between what’s below it as well as what’s above. This metaphor implies that the poorest are part of the problem, part of the squeeze put on the middle. Presumably this is meant to provide a deniable echo for Labour’s long-standing distaste for those right at the bottom of society, the “scroungers” and the like. The reality is that every time benefits are cut or things like the bedroom tax imposed, that’s a squeeze on the bottom, and it’s accompanied by bungs for the better-off: cheap housing to restart the bubble, boosts to personal allowances, and on top of it all, fiddles like non-dom status for the top. The middle may be under pressure, but it’s all from the top. And the bottom bears the weight of both. 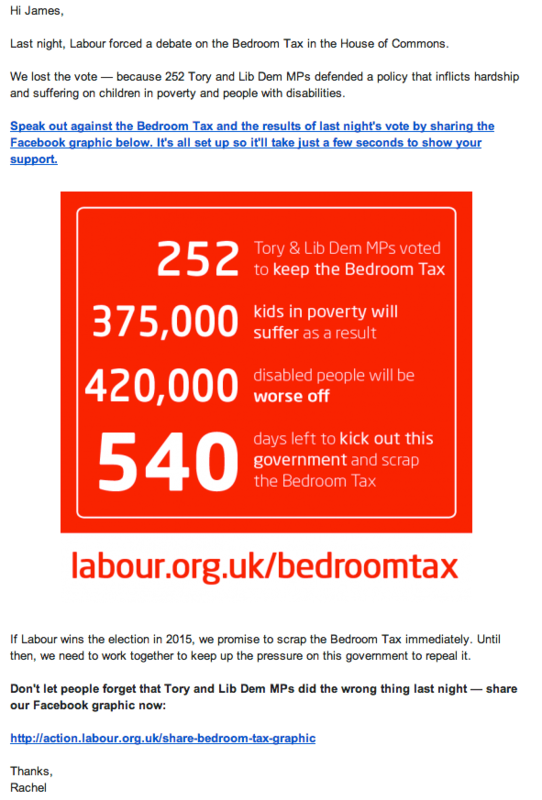 Labour brought a vote yesterday at Westminster on the bedroom tax, calling for its abolition. Great: let’s end this stain on British politics, this attack on the poorest and the most vulnerable, yet another personal cut especially targeted at people with disabilities. On the night only two Lib Dems dared to back Labour – Tim Farron, their next leader, desperate to find the right amount of distance from his own party, plus Andrew George. But with some abstentions, the coalition only secured 252 votes for the bedroom tax. With 257 Labour MPs in the Commons, plus the backing in this case of the SNP, Plaid, Greens and more, this should have been a historic victory over a key bit of Coalition savagery. Unfortunately Labour didn’t turn up. That would have been sufficient. Simply to turn up. Not even all of them, necessarily, although if the poor and vulnerable matter to them, this might take precedence over, well, anything else they might be doing (pairing would have been fine). But no, there were sufficient Labour absentees to save the Tories’ and Lib Dems’ skins. Yesterday Labour were criticising IDS for not turning up to the vote. Oh, the irony. Oh, the hypocrisy. What, seriously, is the point of an opposition that works like this? But it gets worse. For some reason I get Labour spam, and I received this shameless email from Rachel Reeves this morning. If she signed this dishonest missive off herself she doesn’t belong in politics. Update: the full list of those voting is here (h/t). If it turns out I’m wrong and it’s all pairing, I’ll take some of it back. But I wouldn’t have let the Coalition pair on this, on reflection.